Contd. 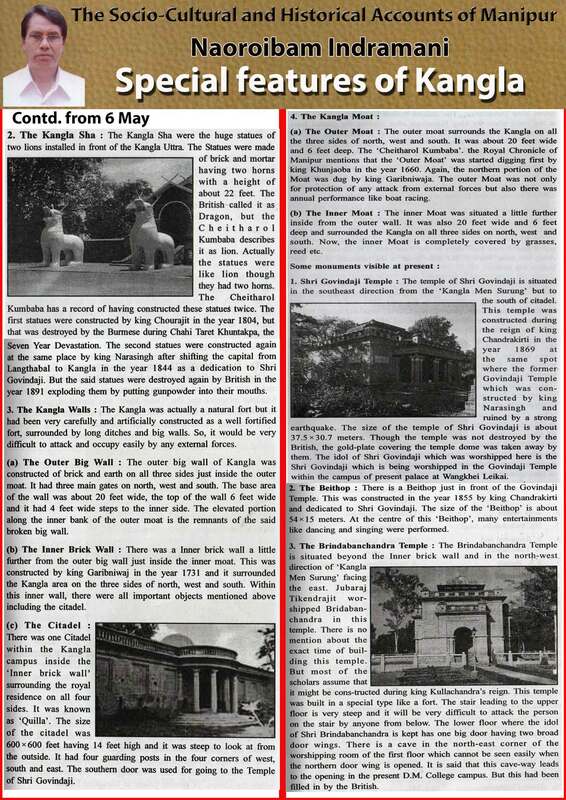 from 6 May 2018: The Kangla Sha: The Kangla Sha were the huge statues of two lions installed in the front of the Kangla Uttra. The Statues were made of brick and mortar having two horns with a heights of about 22 feet. The British called it as Dragon, but the Cheitharol Kumbaba describes it as lion. Actually the statues were line lion through they had two horns. The Cheitharol Kumbaba has a record of having constructed these statues twice. The first statues were constructed by king Chourajit in the year 1804, but that was destroyed by the Burmese during Chahi Taret Khuntakpa, the Seven Years Devastation.